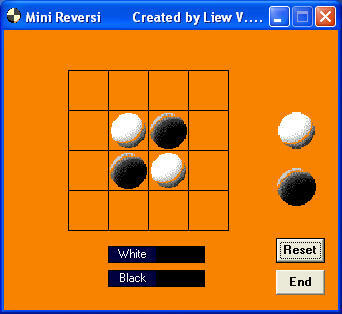 This is the mini version of the typical reversi game. In this program, we use two sets of two-dimensional arrays (4x4)and declare them as Boolean , one represent the white pieces and the other one represent the black pieces. If a white piece or a black piece occupies a square, the variable becomes true , otherwise it is false. By using this concept, the program can check how many white and black pieces appear on the reversi board and which positions they occupy. we use If...Then and Select Case.... End Select statements to check for conditions whether a white piece or a black piece can be place in a certain position so that the pieces trapped in between will change colour. We also added a procedure to display the number of white pieces and the number of black pieces at any one time and also who is the winner. 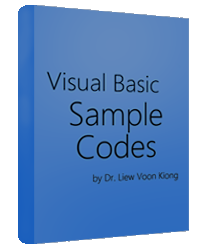 Next we need to create two images, a white solid circle and a black solid circle, save them as jpeg files. Load them into two image controls on the form. You can use whatever name for the two images, we use image17 to denote the while solid circle and image18 to denote the black circle. The two images are very important as we will later use the dragdrop method to enable the user to drag and drop the images into the circles. image18 is a black button.